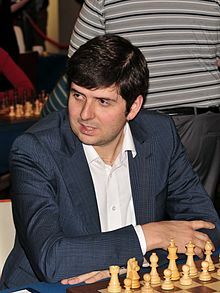 Pyotr Veniaminovich Svidler (Russian: Пётр Вениами́нович Сви́длер; born June 17, 1976, in Leningrad) is a Russian chess Grandmaster. He is seven-time Russian Champion (1994, 1995, 1997, 2003, 2008, 2011, 2013). and has represented Russia at the Chess Olympiad ten times (1994-2010, 2014) securing five team gold medals, two team silvers and an individual bronze. Another major success was his victory in the Chess World Cup 2011. Svidler has competed in three World Championship tournaments - in the period with split title the FIDE World Chess Championship 2002 and 2005, and after the reunification of the title the World Chess Championship 2007. Svidler is a fan of cricket,specially of Tendulkar, of Bob Dylan and of Tom Waits. Svidler learned to play chess when he was six years old. In 1992, he tied for 1st-2nd with Ragim Gasimov in the USSR Junior Open Chess Championship. In 1994 he became Grandmaster and won the under-18 section of the World Youth Chess Championship. In 2001, he reached the semifinals of the FIDE World Championship. Andrei Lukin is his coach. Svidler placed shared second (together with Viswanathan Anand) in the FIDE World Chess Championship 2005 with 8½ points out of 14 games, finishing 1½ points behind the winner, Veselin Topalov. In the World Chess Championship 2007, he placed 5th among the eight players. He has won five team gold medals and one individual bronze medal at Chess Olympiads. Svidler is a noted proponent of Chess960 (also called Fischer Random Chess). He won the first edition of the Chess960 Open held in Mainz, Germany. At the 2003 Mainz Chess Classic, he became Chess960 World Champion by beating Péter Lékó in an eight-game match. He successfully defended his title twice, defeating Levon Aronian in 2004 and Zoltán Almási in 2005, before losing it to Aronian in 2006. In an interview given for World Chess Network after the World Chess Championship 2005 held in San Luis, he said: "I only prepared seriously for San Luis, and I think it has paid off. But in general I spend most of my spare time with my wife and kids, so my relative success in 2005 was a pleasant surprise." His San Luis result earned him direct entry to the World Chess Championship 2007. In that tournament he scored 6½ out of 14, placing 5th out of eight players. In 2006 he went second behind Alexander Grischuk at the World Blitz Championship in Rishon Lezion, Israel, with 10½ points out of 15 games. He also finished tied for first with Vladimir Kramnik at the Dortmund 2006. In February 2009 he came first at the 7th Gibtelecom Masters in Gibraltar. Svidler won the Chess World Cup 2011 in Khanty-Mansiysk, defeating Alexander Grischuk in the finals 2½-1½. Svidler played in the 2013 Candidates Tournament, which took place in London, from 15 March to 1 April. He finished third, with +4−2=8. His four wins were against Radjabov, Aronian, Ivanchuk and Carlsen. In the 2013 Alekhine Memorial tournament, held from 20 April to 1 May, Svidler finished tenth out of ten participants, with +0−3=6. Svidler was selected as the wild card for the 2014 Candidates Tournament, which took place in Khanty-Mansiysk, Russia, from 13 March to 31 March. He finished seventh, with +3−4=7. His three wins were against Kramnik, Andreikin, and Topalov. Svidler reached the final of Chess World Cup 2015 in Baku having defeated on his way there top-seeded Veselin Topalov, Chinese prodigy Wei Yi, and Anish Giri among others. He faced compatriot Sergey Karjakin in the final. Winning the first two games, he needed only a ½ point from the remaining two classical games for the tournament victory. However, he lost both subsequent games and eventually the match 6-4 on blitz tiebreaks. Nonetheless, his second-place finish qualified him to the 2016 Candidates Tournament.